The last time I wrote, I was excited because my mom and sister were coming to visit TT. They left LA last night around midnight, and I just spoke with them and they are both back on the east coast! They did a double Thursday and Friday, and then took the morning class with me on Saturday. That was quite a treat! Even though Because we are assigned lines in the yoga room daily, I was unable to practice next to them, but it was still nice to have them among the nearly 500 people practicing together. We had several classes with Bikram again last week. The heat was fixed and I was pleased with that. I think sweating helped me get whatever sickness out of my sinuses and today I’m feeling 100% back to normal. I’m sure a lot of that had to do with escaping the yoga bubble this weekend AND getting lots of food! one of my favorite things Bikram said this week was “I will never criticize what you don’t have, but I will criticize what you have and don’t know how to use.” While TT isn’t the easiest of programs, I’m doing my best to remain positive and I’m learning how to use what I have (mentally and physically) to get me through the remainder of the weeks. This reminds me a lot of when I was in Ethiopia – I was hungry because my host family didn’t eat a lot and what they did eat, I wasn’t always interesting in sharing, I was lonely because I missed home and I was in a different environment, and I was around a group of girls who have been through many hardships. That situation is a lot like TT – I’m hungry because I eat a lot of raw food due to limited cooking capabilities and time, I’m lonely because I miss my husband, family, friends and just normalcy of Carolina living, and I’m around many many people who have endured addictions, abuse, eating disorders, weight gain/weight loss, losing a loved one, etc. and – everyone in Ethiopia spoke Amharic, and every here speaks, well, DIALOGUE! I have to keep reminding myself, as I did in Ethiopia, who I am coming home to and why I chose to pay what I paid and come here for 9 weeks. At the end of the day, I am very excited to get home and share this yoga and facilitate the healing this yoga allows for if you are open to it. Besides lots of posture clinics last week (we are on cobra/locust today – yay! ), we had a very strange lecture from a body worker. Ask me more about it when I get home if you want to learn more. I did learn, “what we believe is who we are.” And – that’s all I have to say about that at this point! Because we had the pleasure of having the night off on Friday, my mom, sister and I ordered Chinese food. I was asleep by 9! After class on Saturday, I took them down to Manhattan beach to my favorite bagel shop. Then, Sabrina wanted to put her toes in the Pacific Ocean since she has never been there before. The consensus was that there is NOTHING like a Carolina beach – warm water, shells in the sand, and Carolina blue skies. We went to a delicious cupcake shop and ate the most amazing red velvet cupcake I’ve ever had. It was overcast, so no good for a beach day, so we rented a car and went to Beverly Hills. We were driving around neighborhoods and enjoying how the houses were decorated for Halloween. Maybe I’ll go over there to go trick-or-treating! 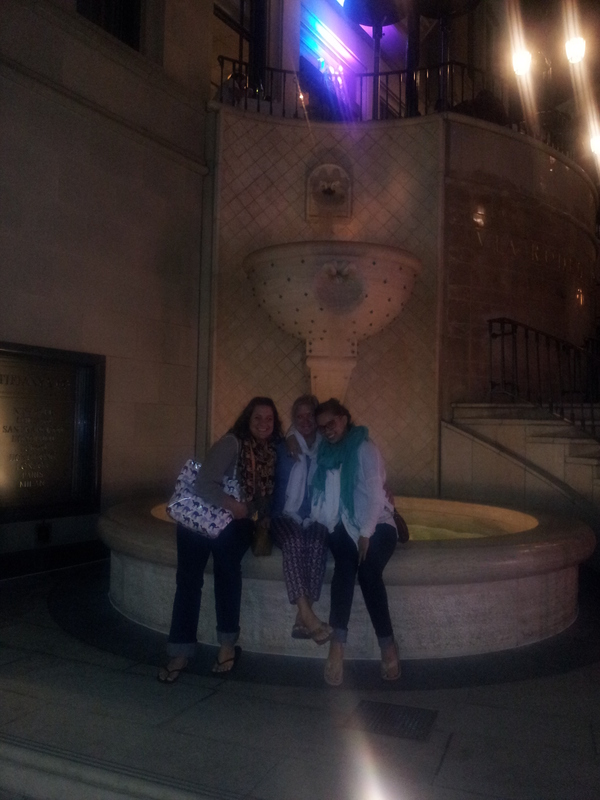 We had a fantastic dinner on Rodeo Drive. 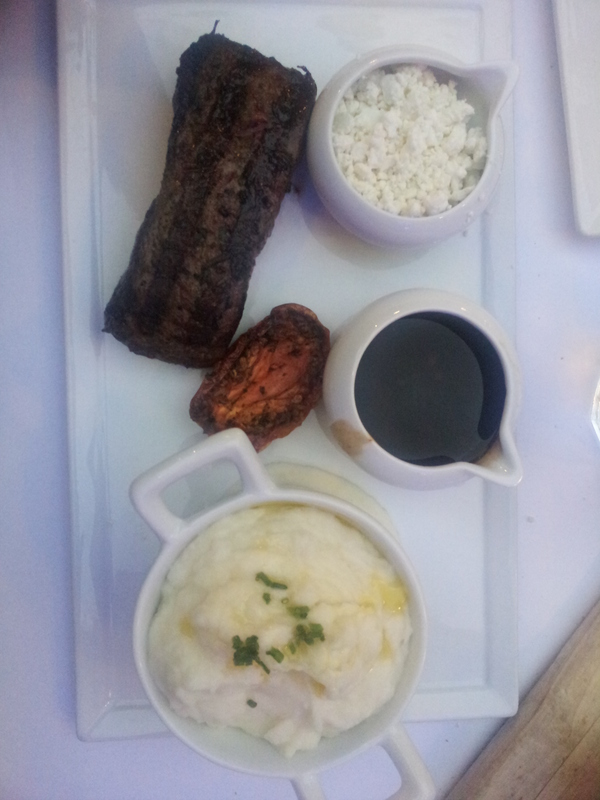 I had a steak with goat cheese and pepper sauce, and olive oil mashed potatoes. It was SO GOOD. I haven’t had a piece of meat like that since I’ve been out here so it was to die for! On our way back, we stopped at Whole Foods for some gelato. Of course, I got blackberry sherbet. We had to get well rested Saturday night because we planned to get up early Sunday to head to the Mohave desert! My breakfast on the way to the desert consisted of a cannoli from a Mexican bakery my mom insisted on stopping at. I was fine with that! It took us longer to get out there than planned (2.5 hour drive normally), because we made quite a few stops to check some things out on our way. We saw a stand that said “avocados 7 for 99 cents!” We turned around to find it, but it must have been a mirage because we couldn’t find it! Too good to be true, I guess! we stopped in Palm Springs to take some pictures, then we headed towards Joshua Tree National Forest. 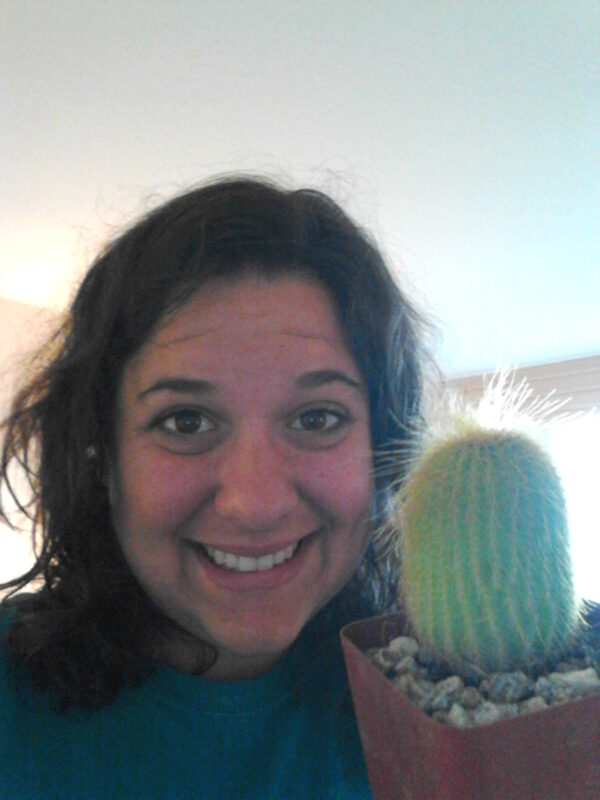 What is a Joshua Tree? I’m still not sure, but it looks like something Dr. Seuss created. Before we went in to the park, we stopped for burritos. We figured they would be delicious because it is California and everything. Well, I’m not sure what was in mine but it looked and tasted like it was made several days before hand. We couldn’t stop laughing at them, so my mom put them in the trunk LOL. Joshua tree national forest, was so different than what I expected! After seeing the Sahara Desert, and taking a cruise on the Nile, my perception of “THE DESERT” is so different than how the desert looks in the Western US! I started getting really nauseous. Several factors could have contributed to this: 1) mom doing standing head to knee on a cliff, 2) my burrito, 3) the 5,000 foot altitude, 4) the trees/rocks all looking the same, 5) the way the rocks looked like they were strategically stacked but was actually due to the earthquakes, or 6) that I was doing backbends everywhere we went. I don’t know, but I sure was dizzy! We went all over the park – probably spent an hour or 2 in there just driving around. We were so sandy and dusty! We found this one rock called skull rock, and well it looked like a skull! I couldn’t get out to take a picture with it (I was wearing a skull shirt) because I was so nauseous, but my mom (OF COURSE) stopped and took a picture. After we left the park, Sabrina said she never wanted to hear the word Joshua Tree again. After all, we had been talking about these Joshua Trees for 2 days. On our way back, we stopped at Ralphs and got some goodies for the remainder of the week! We hung out for a bit, I did the entire dialogue for Sabrina, and I was SO surprised how much I remembered! Their flight was around midnight, so they left the hotel late at night. I am all refreshed to take on week 6! It was so fun getting out of the Radisson/yoga bubble, driving in a car (haven’t done that in 5 weeks! ), and eating lots of delicious food (and not so delicious, like the burrito). For the first time in 5 weeks, I ate because I wanted to and enjoyed the taste of my food – not because I needed food for the calories or protein or carbs for my next class. This week we are supposedly doing 2-3 postures a day. Bring it on. I am ready to see my group 16 again after a weekend break of yoga/dialogue. let no one steal your peace!!! happy to be out of the yoga bubble for a bit, and get some wide open fresh air and sun!!!!! BYTT is hotter than the Mojave Desert.